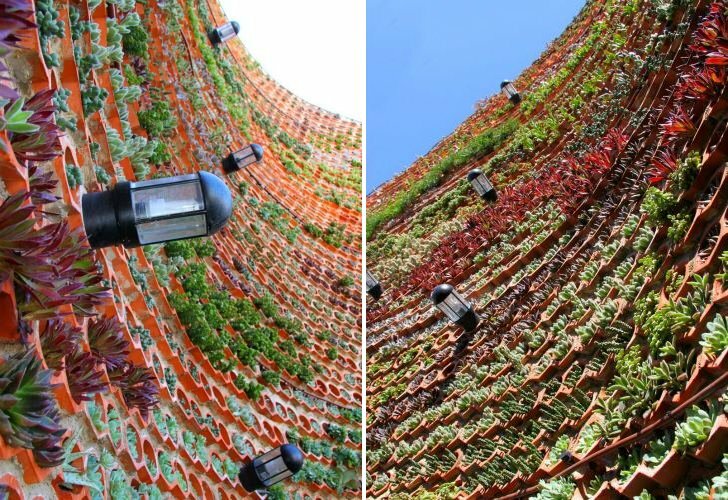 We all know Ibiza is well known for its night life, but it may also become known for it's vertical gardens -- Spanish landscape experts Urbanarbolismo just completed a gorgeous living wall in the courtyard of the Ushuaia Ibiza Hotel. The vertical garden serves as a sound barrier for the outdoor club while creating a colorful, living addition to the crisp white hotel and bright blue skies. The wall also features an innovative low-tech, low-maintenance watering system developed with the help of Alijardín and Forest Alicante. The vertical garden was designed to create a sound barrier between the club’s outdoor central courtyard and nearby apartments. As the plants grow to maturity, they will help absorb more sound and create a more intimate space within the courtyard. An undulating terra-cotta-colored wall surrounds the courtyard, and a smaller living wall serves as the entrance on the outside. 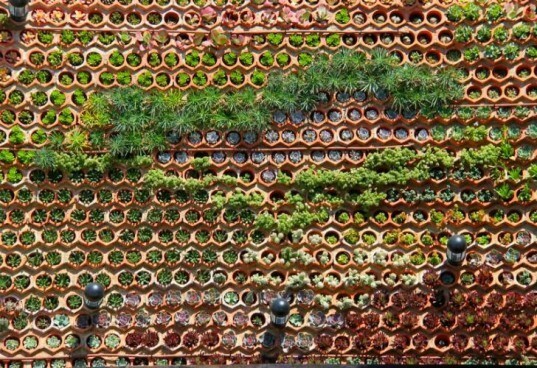 The planting medium is composed of a series of stacked ceramic hexagonal elements filled with soil and plants. The wall is planted with euphorbia, echeveria, aeonium, kalanchoe, sedum and sedeveria — varietals that thrive in the warm, mediterranean climate of Ibiza. As the wall matures a rainbow of colors will emerge and different plants will bloom throughout the year. The plants were carefully arranged to take into account soil type and sun exposure. Urbanarbolismo also developed a low-tech irrigation system that moves away from complex automated watering system. The ceramic elements are installed so that they are angled in towards the wall, allowing water to collect in each tube. According to Urbanarbolismo this is the first vertical garden of its kind, and they see the concept taking root with home gardeners. The vertical garden was designed to create a sound barrier between the club's outdoor central courtyard and nearby apartments. As the plants grow to maturity, they will help absorb more sound and create a more intimate space within the courtyard. An undulating terra-cotta-colored wall surrounds the courtyard, and a smaller living wall serves as the entrance on the outside. The planting medium is composed of a series of stacked ceramic hexagonal elements filled with soil and plants. The wall is planted with euphorbia, echeveria, aeonium, kalanchoe, sedum and sedeveria -- varietals that thrive in the warm, mediterranean climate of Ibiza. As the wall matures a rainbow of colors will emerge and different plants will bloom throughout the year. Urbanarbolismo also developed a low-tech irrigation system that moves away from complex automated watering system. he ceramic elements are installed so that they are angled in towards the wall, allowing water to collect in each tube. According to Urbanarbolismo this is the first vertical garden of its kind, and they see the concept taking root with home gardeners.